Our premier wargaming event was a total, rowdy success, and we’ve spent several days recovering from all the excitement! Finally, we’re feeling coherent enough that we can bring you a full report on the Prague Open 2019. With a grand total of 230 awesome participants from all over Europe, the UK, and the rest of the world, we served up epic battles and tense skirmishes in four massive events spanning two full days! Without a doubt our biggest turnout was for the long awaited Warhammer 40k team tournament, where a hundred players split into twenty squads to battle for dominance with a rules set inspired by the ETC format. If you want to check out the rankings of our top three teams, you can see them here. For a full breakdown of the army lists our competitors brought to bear, check out our report here. Coming in at number two was the Warhammer 40k classic singles tournament, where 74 players clashed to prove who among them was the greatest commander across 5 grueling matches. This event granted ITC points and used a rules set based on the German national league, Tabletopmasters. Click here to see the top three generals ranked against each other, and here for a full review of all the massive armies that made planetfall. Both of these epic events showcased out brand new range of tournament terrain, and we are pleased to announce that it was a total success! Designed to provide full gaming functionality for competitive Warhammer 40000 matches, this terrain made its debut at the Prague Open this year and we’ve been flooded with positive feedback from all our players. The terrain itself is designed for ease of assembly, with very little gluing required, and the best part is that all the terrain comes pre-colored right out of the box, so that there will never be any lumps of ugly, gray plastic on your battlefield! You can check out the full catalog of our dynamic terrain range and pre-order your very own battlefield scenics here. With a total of 32 players, our Age of Sigmar event was a sight to behold! Players came from all across Europe and beyond to wage fantasy warfare against one another, and the result was a great crowd of diverse players putting their armies to the test. Age of Sigmar has only just been established on the tournament circuit in our region, but after such a great showing we’ll be bringing it back for sure in 2020. As always, our top rankings are listed here, and you can find everyone’s full army lists here. Our final event was our raucous Blood Bowl tournament, featuring 22 players fielding their elite teams for two straight days of mud and carnage! Results for the tournament can be found here. We had such a great time hosting this event; it was brutal in all the best ways! Be sure to check out the full gallery of the event right here, so you can get an up close and personal view of all the tactical mayhem. With so many awesome players making the trip to be a part of our event, we can’t wait to bring you an even wilder contest next year! New release: double-sided mat Chemzone and Necropolis! New double-sided mat combination! Kill team size 22"x30" and classic Warhammer 40k size 6'x4'. Two popular designs combined: Chemzone-Necropolis. Check it out! The Portal is our new addition to Necropolis terrain range (but of course this piece can fit any sci-fi themed table). The Portal - truly a great centerpiece, with 30 by 30 cm base, and 15cm heigh, shows the hi-tech technology used to open and maintain the warp-gates at the Necropolis project. Portal is made of resin, and is sold pre-painted, as can be seen on the pictures around. We would like to highlight few features of it:- on sides it has 4 connectors - which will fit by size our pipes (Chem-Zone Conduit system) thus you can create system of the power lines for the Portal.- it provides plenty of cover in skirmish games as Necromunda or Kill Team - you can partially or fully hide the models on many places around or on top of it.- Also for games of Warhammer 40k it suits as "ruin area" type of terrain - you can easily fit 10 miniatures with 32mm bases on top platforms of the Portal. We are really looking forward to build soon a table using the Portal as centerpiece. Connect it with conduits to generators (check out our Industrial Generators terrain) and create fantasic looking sci-fi industrial battlefield. November: Our first ever MDF terrain, Campaign works and Necropolis expansions. Years ago, we were so sure we would never go the way of MDF terrain. But of course, never say never! With the growing attendance of our own Warhammer 40k event - Prague Open 2019 - we realized that we needed an effective solution to cover lots of tables with quality terrain and minimal costs. We studied all the needs of competitive gaming, considered the functionality of the products and consulted with the London GT management (we were the other bidder for the official LGT terrains, but we came too late in the bid). Now, we are proud to present you our first Tournament Terrain MDF set, fully pre-printed with coloured textures for a no hassle, no paint solution to your tournament needs! This set is HUGE and covers all the needs of a 6x4 foot competitive Warhammer 40 000 table with ease. Please bear in mind we are currently upgrading the printed texture of the set, and within weeks we will reveal much appealing looks. We promised in previous posts we would be running a detailed, narrative campaign in a Necropolis setting, with lots of custom rules and narrative written by professional writer Alex Simon. We are still working on that! The concept and ideas are taking shape. The main course, the fantastic miniatures which will be part of the campaign, are just being painted for us at very high standard at Den of Imagination studio. We would like to give a big thanks for the hard work of this amazing painting studio. But to be honest - we will be ready with all the needed models no earlier than end of January. We are 90% sure we’ll be using the Necromunda system for that, as it allows really deep and customizable rule sets. We plan to include many vehicles, custom miniatures and missions, and then wrap all up it for you as a bundled campaign guide at the end. That way, we hope to inspire you to start your own campaign using the framework we’ve provided, and take the battle to the Necropolis yourselves! We thought for a while about using the Kill Team system, but it seems to be much harder to tailor the rules to fit our custom narrative. Of course, if our fans enjoy our Necropolis campaign then we might revisit it with Kill Team rules as well. On a final note, have a look at the fantastic 3D sculpt master-model for our upcoming Necropolis Portal. It is a true centrepiece for your table, around 30cm in diameter and 15cm in height. The portal offers plenty of space for placing miniatures on top so it can serve as a fortification in 40k, and plenty of line of sight cover for all other skirmish games like Kill Team and Necromunda. We hope to have this lovely piece in stock by end of January as well, and to include it in our campaign. After all, this portal was the great and terrible success that saw the Necropolis project abandoned! We are so hyped about Necropolis. You can tell I guess:) I think we made an outstanding combination of narrative and functional terrain, which is usable in many 28-32mm wargaming systems. Those huge Necropolis Hab-Blocks are one of the largest and best L-shape LOS blocks you can wish for your games of Warhammer 40000. In addition with many platforms from both sides those buildings are serving as a ruin/area terrain of a sort as well. And just connect some of the Tech-Shafts to a Hab-Block and you can wrac havoc with your Necromunda gangs or Kill Teams. That way Necropolis set becomes great multi-level terrain with lots of cover opportunities for skirmish games! We were so excited how the Necropolis project evolved, that we have setup cooperation with professional writer Alexander Simon, who helped us a lot to shape the story and he will be developing it further for us. That brings us to an idea of making a photo-narrative campaign, most probably using Necromunda rules set. The campaign will tell a story of Necropolis based on inter-linked games played in our studio. We plan to use outstanding miniatures painted for us by Den of Imagination painting studio. Campaign will have very rich narrative story and we will use lot of vehicles and conversions with bespoked rules and missions to create really exceptional experience that you may all follow and enjoy. Possibly taking inspiration for your own games, or just enjoying the story and rich visuals. Project Necropolis, a black site project long abandoned and better off forgotten. Unspoken of for decades, it was yet another instance of mankind’s reach exceeding its grasp as Imperial scientists tampered with the very foundations of the universe in an attempt to create planetary warp gates. Claw marks scarred into the plasteel walls of the abandoned hab-blocks and twisting, labyrinthine service tunnels tell a story of brief, violent struggle. Half-finished experiments still writhe in containment caskets abandoned in the streets, and the grav-trains still trundle along their lonely routes, carrying nothing but angry ghosts and grim reminders of the costs when mankind plays at godhood. This lonely testament to the price of success threatens to divulge its secrets to the galaxy as a distress beacon is activated, and it is only a matter of time before curiosity brings traders and treasure seekers down to the surface. In a desperate bid to keep Necropolis and its secrets buried, kill teams are dispatched to terminate the signal, and retrieve the data ark at the heart of the facility. But there are things stirring in the dark, and not all that is buried is truly dead. Last but not least - we are going to participate at Alliance GT event in Amsterdam. Warhammer 40k GT with 120 players and fantastic international player base. We are looking forward to meet the organization team, and many others, just mentioning bosses like Lawrence Baker and Tabletop Tactics or Mike Herbert from Hellstorm Wargaming. We cooperate with them online and this would be great opportunity to meet again or shake hands for a first time with them. That is exactly the case of us at Gamemat.eu here in Prague. With colder weather, earlier sunsets and kids in school we are again on a full throttle towards the hobby. With great cheer we have finally released the Chem-Zone complete terrain set. It was one of our most intense project. We were working hard to create detailed molds and new cool paint-schemes to bring you very complex battlefield scenery. Celebrating this release with new cool video as well. In the video the Chem-Zone pieces are in a concert with Gothic Ruins terrain and Quarantine battle mat. September is also full of other news. We have started cooperation with new painting studio Den Of Imagination and they've just finished for us first GM.eu official studio army! 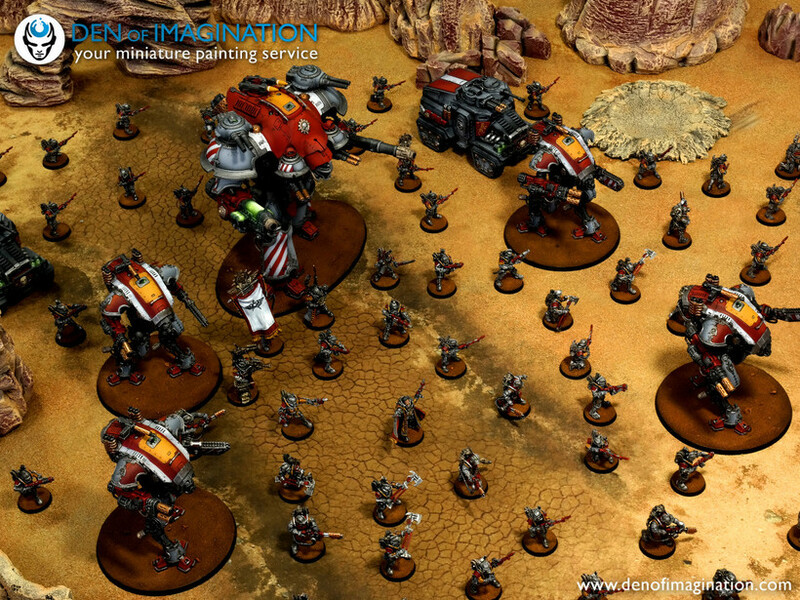 Army based on Imperial Knights and Militarum Tempestus Scions, but with a visual twist using Solar Auxilia miniatures as proxies for Scions. I hope you like it as we do. We are going to post full gallery soon. This month we plan to reveal all the details about our upcoming wargaming event: Prague Open 2019. Confirmed dates are February 16-17th 2019 and we are about to start ticket sales on our site within few weeks. After 2 successfull events with just Warhammer 40000 GT singles, this year we are adding Warhammer 40k team tournament and Age of Sigmar GT singles and also Kill Team side event. Event will be held at Top Hotel Prague with catering arranged. Prague Open has been so far always tournament with mostly international player base and everybody enjoyed the beautiful city of Prague aside of gaming. We hope to meet you all in Prague in 2019! Our fisrt blog post starts to be bit too bulky and I think it is time to finish it here with great thanks to all you wargamers, who are making all this possible by supporting us. Just a little teaser what is coming next: within two months we will reveal a brand new product range: complete set of new battle mat and matching terrain. A sci-fi horror themed. Everybody who is fond of movies like Event Horizon, Aliens, or Doom video games should be thrilled. Also those who praise powers of Chaos should be ready! We believe that playing your favorite wargame in a setting of doomed research facility, where strange experiments took place ages ago would be fun! As you know, things can go wrong sometimes. And they always do, especially when you experimented with openning the warp. Little teaser here.